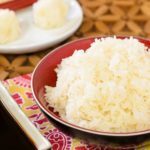 A recipe for Thai Sticky Rice. It is a great side dish simply prepared using glutinous rice. You can roll it up into balls and use it like bread to dip in sauces. Soak the rice overnight with enough water to cover 3 inches above the rice. Drain and wrap with cheesecloth. Place rice in the top of a steamer over simmering water. Do not to let the bottom of the steamer touch the water. Put the lid on the steamer and steam until rice is soft and translucent, about 30 to 35 minutes. Turn the rice over in the steamer after about 15 minutes for even cooking. Serve immediately in a covered dish. Keep rice covered to stay warm and moist or it will dry out quickly as it cools.